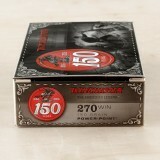 This .270 Winchester hunting ammunition comes with special packaging to celebrate the 150th anniversary of the Winchester brand. 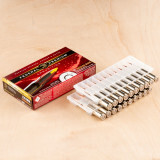 Inside the box you'll find 20 soft point cartridges ideal for taking down a variety of game including deer, large varmints, and predators. 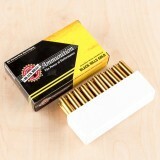 Each round in this box of 20 fires a 150 grain bullet that fires at a muzzle velocity of 2,850 feet per second. This high velocity gives the soft point projectile strong expansion potential while keeping fragmentation to a manageable level. 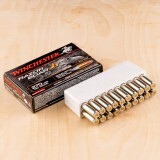 Winchester ammunition is made in the USA using non-corrosive Boxer primers and reloadable brass cases. 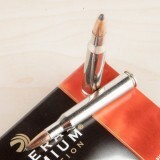 Prvi Partizan, a Serbian ammunition manufacturer, makes two rounds for a .270 rifle: a 130-grain, and this one, the larger 150-grain round. 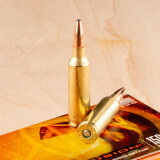 Compared to the smaller bullets, the 150-grain cartridge has a slower velocity and less muzzle energy, but it remains a highly-effective round for big game hunting, including whitetail deer, black bear, and antelope. 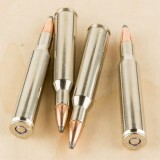 While it performs well up to 150 yards the bullet will begin to drop by as much as 17 centimeters when it reaches 250 meters, dropping over 34 centimeters after 300 yards. 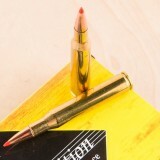 For this reason, it is not generally considered a “long range” bullet. It has an initial muzzle velocity of 2,837 feet per second and a muzzle energy at 2,677 foot-pounds. 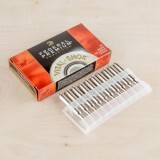 Prvi Partizan has been a global leader in ammunition and reloading since 1922. They have a meticulous manufacturing and inspection process that has resulted in some of the most reliable rounds you can find. 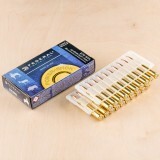 They are one of the top choices for both hunting and target shooting. 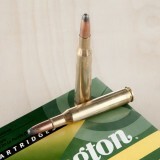 Made popular through the writings of the gun journalist Jack O'Connor, the 270 is one of the most popular hunting rifle rounds in America. 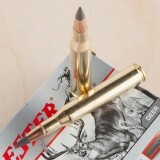 Developed in 1923 by Winchester, this round is great for taking out game all the way from predators to elk. With its accuracy, power, and range, you have everything you need for hunting the delicious animals you love. Founded in 1855, Winchester has developed many of the rounds we use today and creates some of the best ammunition in the world. 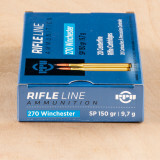 With Winchester rounds in your rifle, you can feel confident in the reliability, accuracy, and quality they have. These 150 grain, power point, Winchester Super-X rounds fire at 2,850 feet per second and have the fantastic expansion, high accuracy, and incredible terminal performance you need to take down any deer you please. 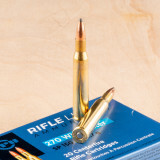 The .270 Winchester is one of the most popular rounds for medium-sized game such as deer and black bear, and if you use this cartridge for your adventures, make sure you have a cartridge that delivers both accuracy and terminal performance. 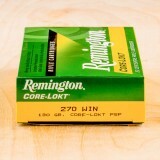 With this box, youâ€™ll have 20-rounds of Remingtonâ€™s Core-Lokt ammunition, a popular brand for hunting. 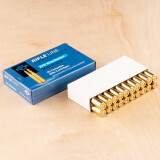 The 150-grain Core-Lokt bullets in these cartridges gives you a soft-point tip with a sturdy jacket. 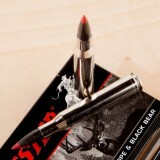 Youâ€™ll have expansion and penetration, allowing you to take the most effective shots while hunting. 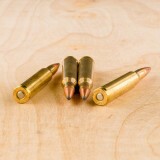 The bullet exits the muzzle with a velocity of 2,850 feet per second and maintains a speed of 1,886 feet per second after 300 yards. 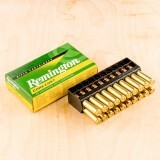 Remington is well-known for their rifles, but they also make some of the finest ammunition in the world. 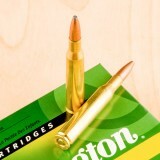 For hunters who want the most precise and effective cartridges, Remington is a trusted name. 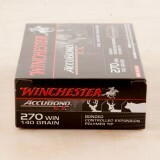 If you use .270 Winchester ammo for deer and other medium-sized game, order this 20-round box of cartridges and youâ€™ll have accuracy, speed, and terminal performance. This will result in more consistent shot placement and better results when you take to the woods. 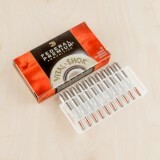 Federalâ€™s Power-Shok brand is an affordable line of game loads that have excellent materials and quality designs. 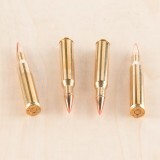 These cartridges give you the speed required for the best penetration. 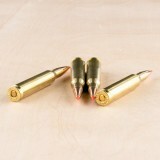 They have a muzzle velocity of 2,830 feet per second and maintain a speed of 1,871 fps after 300 yards. 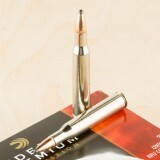 This allows the soft point tip to expand as needed while driving excellent penetration. The result is a quick-acting, humane shot on your medium-game target. 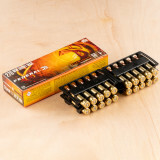 Federal Premium Ammunition is one of the most popular companies for outdoor ammunition. They have hunting cartridges and shells of all varieties, as well as a full supply of muzzleloading and reloading equipment. This American company is headquartered in Anoka, Minnesota. 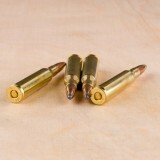 Soft point loads are the way to go when you depend on your .270 Winchester rifle to put food on the table. These rounds from Sellier & Bellot are made in the Czech Republic where they are subjected to intense inspection before being shipped out. As part of the CBC group, Sellier & Bellot has access to tons of shared data along with their own manufacturing experience, allowing them to make cartridges to answer the needs of the American shooting public. 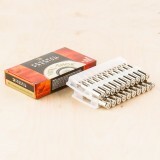 Each cartridge is made using traditional components that won't let you down when it counts. Components include reloadable brass casings that are fitted with non-corrosive Boxer primers and filled with a proven propellant mixture. 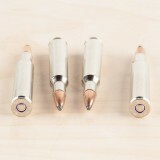 Each case is crimped to a soft point bullet's knurled surface, creating a lock that prevents setback and ensures maximum accuracy throughout loading and chambering. 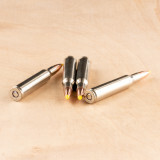 The soft point bullet itself weighs in at 150 grains, a stable for the .270 caliber, and has a smooth-feeding round nose with an exposed lead tip. This design promotes disruptive expansion in a target while the cannelure precludes jacket separation, guaranteeing maximum energy transfer into a game animal's vitals. 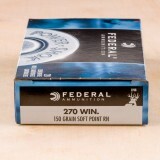 Federal Power-Shok ammunition delivers superb performance against deer and other game while still costing much less than the latest whiz-bang loads. The simple but effective soft point design delivers strong terminal performance without tissue-destroying fragmentation--an important benefit if you like to eat what you shoot. 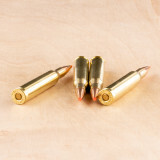 Each .270 Winchester round in this case of 200 fires a 130 grain bullet at 3,060 feet per second, producing flat trajectories and high diameter expansion for excellent results against midsize game. 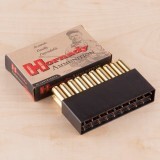 Power-Shok ammo is loaded in Anoka, Minnesota using non-corrosive primers and reloadable brass cases. 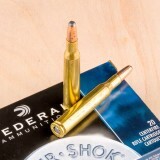 Federal Power-Shok ammunition is widely used by hunters due to its excellent blend of affordability, accuracy, and terminal effectiveness. 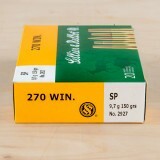 These .270 Winchester cartridges work well on a variety of game including deer and boar. 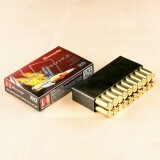 Each cartridge in this box of 20 fires a 130 grain soft point bullet at a muzzle velocity of 3,060 feet per second. This results in excellent expansion potential without exessive fragmentation. Power-Shok cartridges are loaded at Federal's headquarters in Anoka, Minnesota using non-corrosive primers and brass cases. The 270 was developed by Winchester in 1923 and in the over eighty years it has been around, it has become one of the most popular hunting rounds in the country, largely through the efforts of the gunwriter Jack O'Connor. 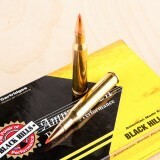 With this fantastic rifle round, you have everything you need to take down game from small predators to elk, and it is accurate enough to use in shooting matches, helping you succeed in all your shooting endeavors. 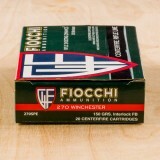 Fiocchi is the oldest firearms and ammunition company in Italy and is one of the best and most respected around the world. Still owned and managed by the same family that founded it in 1876, they pour everything they have into making the best ammo possible. 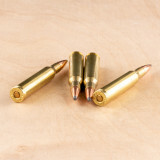 These 130 grain, pointed soft point, brass cased, boxer primed rounds fire at 3010 feet per second with fantastic accuracy and reliability and hit with phenomenal results, helping you take down any deer you wish. 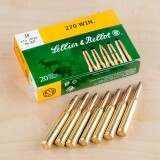 270 Winchester ammo complete with Brass cases and a Pointed Soft-Point (PSP) projectile. 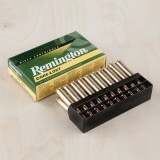 Manufactured by Remington to the highest of standards with a Boxer primer and 130 Grain bullet, the quality components come together and add up to a round that's great for hunting whitetail deer. 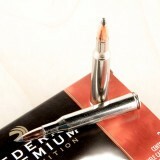 You'll get 20 rounds shipped fast when you order this today. 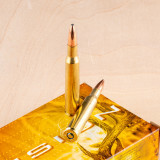 The 270 Winchester was developed in 1923 and has gained popularity and a fantastic reputation all over the United States. Made popular through the praise of gunwriter Jack O'Connor and through its own inherent fantastic qualities, the 270 Winchester has become one of America's favorite hunting rifles. 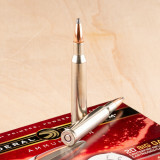 Whether you want to take down deer, elk, or another animal, this amazing round is perfect for you. 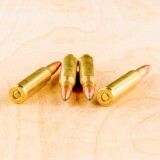 Founded in 1922 and producing some of America's favorite ammunition for nearly a century, Federal has become one of the top three ammunition manufacturers in the United States. 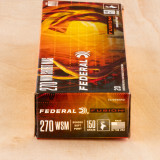 Whether you need something inexpensive to hunt or plink with or something top of the line for maximum efficacy, Federal has exactly what you need. 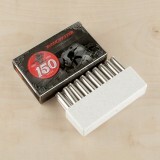 With these 150 grain, Federal Fusion, soft point, reloadable rounds, you have the mushrooming and hard hitting power you need to take out any of the delicious boars or deer that roam your woods. Developed in 1923 and made popular through the writings of the firearms journalist Jack O'Connor, the 270 Winchester is a fantastic rifle round for hunting and match competing. 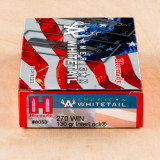 With its accuracy, amazing range, and great power, the 270 Winchester can help you win your next shooting competition or take down most North American game. 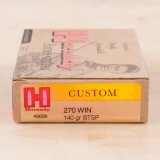 Hornady has been around since 1949 and with their incredible dedication and innovation, they have created some of the most effective ammunition on the market. 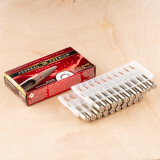 These Hornady American Whitetail rounds feature 130 grain soft point bullets that offer controlled expansion and consistent penetration for thin skin game hunting. 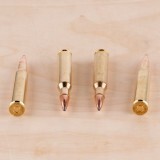 Each projectile is loaded into a reloadable boxer primed brass cased. You can expect muzzle velocities around 3060 feet per second. 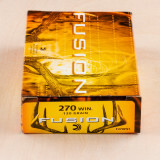 An excellent choice if you're in search of a great 270 Winchester round for hunting whitetail deer. 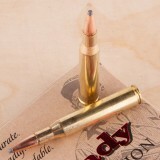 This New Federal ammo comes loaded with a 130 Grain Fusion along with a Boxer primer that's loaded in a Brass case. 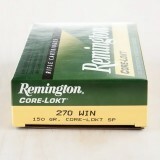 With this package, you'll receive 20 rounds ready to fire. Plus, you know it'll come fast from our warehouse to your door because we know shooting ammo is a lot more fun than looking at it online or waiting on delivery! 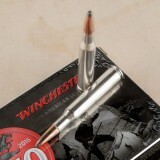 Popularized by the writings of the firearms journalist Jack O'Connor and his high praise, the 270 is an incredible hunting round, developed by Winchester in 1923. Whether you are looking to hunt predators, deer, or even elk, the 270 has all the power and range you need to perform at highest capacity. 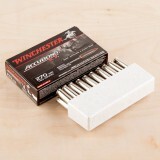 Winchester has been around since their debut in 1855, six years before the Civil War here in America. With their incredible ammunition, Winchester has given the American people the ammunition they need for nearly a century and a half, helping them become one of the most popular ammunition manufacturers in the nation. 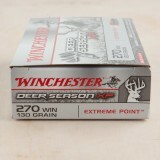 With these Winchester Deer Season XP, 130 grain, extreme point, brass cased, boxer primed rounds, firing at 3060 feet per second, you have the specially designed rounds for deer hunting you need for taking out your favorite game with ease. 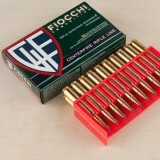 This .270 Winchester ammunition from Fiocchi excels at taking deer and other midsize game. 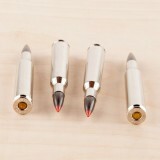 These cartridges fire soft point bullets that deliver lethal expansion and strong penetration without the fragmentation typical of hollow points. This results in a clean kill with minimal meat loss--a big plus if you like to eat what you shoot! 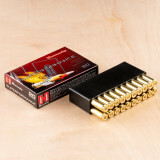 Each cartridge in this box of 20 fires a 150 grain bullet at a muzzle velocity of 2,850 feet per second, producing flat trajectories and excellent accuracy. 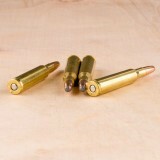 The high velocity contributes to the projectile's ability to mushroom into a high diameter shape for maximum terminal performance. 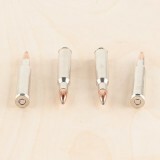 These soft point bullets are fitted with polymer tips that enhance their external ballistics, ensuring that your well-placed shot flies true! 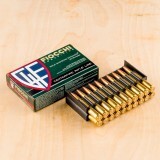 These cartridges are made by Fiocchi of America in Ozark, Missouri using non-corrosive Boxer primers and reloadable brass cases. 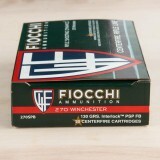 Fiocchi is an Italian company that has been in business since the 19th century and produces ammo for both defense and sporting applications. 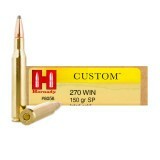 20 rounds of Hornady 270 Winchester ammo that'll have your gun firing for a while and your face smiling for even longer! 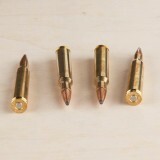 The Boxer primer, 150 Grain Soft-Point (SP) bullet and Brass cases on these New rounds make for the perfect companion for hunting big game, hunting whitetail deer. 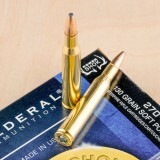 Pick up some rounds today and you'll get fast shipping along with Widener's world class service. 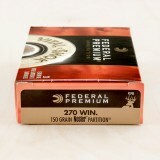 20 rounds of Federal 270 Winchester ammo that'll have your gun firing for a while and your face smiling for even longer! The Boxer primer, 130 Grain Soft-Point Boat Tail (SP-BT) bullet and Nickel-Plated Brass cases on these New rounds make for the perfect companion for hunting whitetail deer. 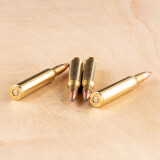 Pick up some rounds today and you'll get fast shipping along with Widener's world class service. 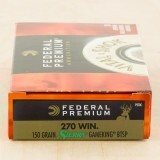 An excellent choice if you're in search of a great 270 Winchester round for hunting boar, hunting whitetail deer. 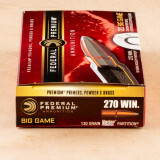 This New Federal ammo comes loaded with a 150 Grain Soft-Point Boat Tail (SP-BT) along with a Boxer primer that's loaded in a Nickel-Plated Brass case. With this package, you'll receive 20 rounds ready to fire. Plus, you know it'll come fast from our warehouse to your door because we know shooting ammo is a lot more fun than looking at it online or waiting on delivery! 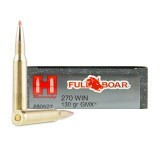 An excellent choice if you're in search of a great 270 Winchester round for hunting boar, hunting whitetail deer. 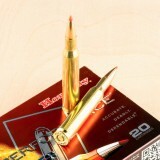 This New Hornady ammo comes loaded with a 140 Grain Soft-Point Boat Tail (SP-BT) along with a Boxer primer that's loaded in a Brass case. With this package, you'll receive 20 rounds ready to fire. Plus, you know it'll come fast from our warehouse to your door because we know shooting ammo is a lot more fun than looking at it online or waiting on delivery! 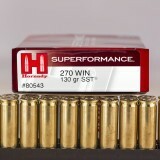 20 rounds of Hornady 270 Winchester ammo that'll have your gun firing for a while and your face smiling for even longer! The Boxer primer, 140 Grain SST bullet and Brass cases on these New rounds make for the perfect companion for hunting whitetail deer. 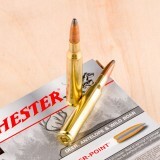 Pick up some rounds today and you'll get fast shipping along with Widener's world class service. 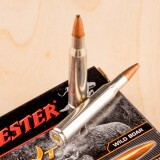 Nosler Ballistic Tip ammo that's as ready as you are for hunting whitetail deer. 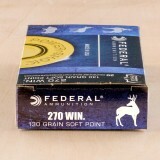 Made by Federal, this 270 Winchester ammunition is Brass-cased, Boxer-primed with a 130 Grain bullet. 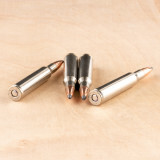 These are trusted New rounds so sleep easy knowing you're picking up 20 rounds of 270 Winchester that promises reliable feeding and extraction shot after shot. 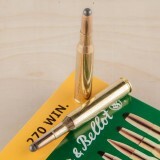 270 Winchester ammo complete with Brass cases and a GMX projectile. 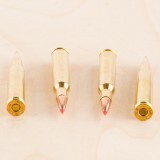 Manufactured by Hornady to the highest of standards with a Boxer primer and 130 Grain bullet, the quality components come together and add up to a round that's great for hunting boar. 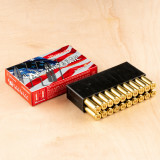 You'll get 20 rounds shipped fast when you order this today. This is a great round for hunting whitetail deer, varmint hunting. 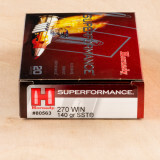 From Hornady, this 270 Winchester ammunition is New with a SST 130 Grain bullet. 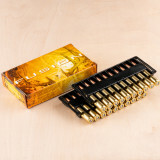 You'll get 20 rounds of Brass cased ammo that's ready for your next trip out to shoot. Like every round for sale, we stand behind this ammo and have your back so rest assured you're not only getting a good deal, you're getting the peace of mind that comes along with a trusted supplier. 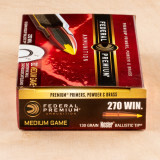 These .270 Winchester cartridges are loaded with 130-grain Federal Vital-Shok projectiles that deliver expansion and penetration to the target. Using the Partition design from Nosler with a soft point, these cartridges are not only fast and powerful, they have the right engineering for effective shots on medium game. The Partition design separated two internal cores. The front core expands while the back core maintains its shape, helping to drive deeper penetration. 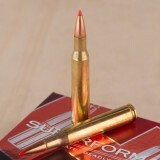 This is a design that has revolutionized hunting ammunition, and itâ€™s perfect for medium game like deer or pronghorn. 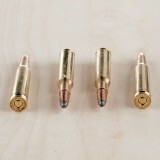 These cartridges also have power and velocity to support the projectileâ€™s performance, with a muzzle speed of 3,060 feet per second and a muzzle energy of 2,703 foot pounds. 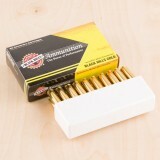 No matter what type of firearm you own, you can turn to Federal Premium Ammunition for all your needs. 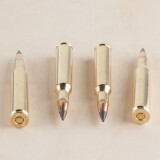 They have items for small game hunting, personal defense, and target competitions, as well as items for cartridge reloading. 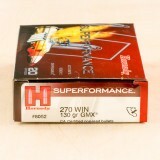 When you want a highly effective hunting rifle, the 270 is one of the best rounds you could hope to get. 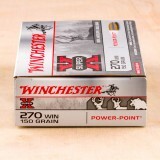 Developed by Winchester in 1923, the 270 is great for taking out game all the way from predators to elk and bear and is also great in shooting competitions. 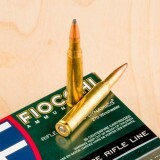 Popularized through the writings of the firearms journalist Jack O'Connor, the 270 is just the highly effective rifle round you need for all your shooting purposes. Creating some of the best ammunition in the world since their debut in the mid 1900's, Hornady is one of the best ammunition manufacturers around the globe. 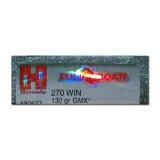 With their incredible innovation and high quality manufacturing, you can't go wrong with Hornady ammo. 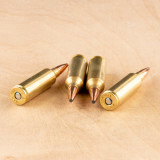 Firing at 3190 feet per second, these phenomenal, 130 grain, GMX, brass cased, boxer primed rounds have incredible accuracy, phenomenal expansion, and higher speeds than other rounds, making them perfect for all your deer hunting and match competing needs. 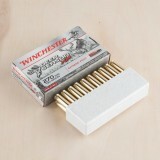 270 Winchester ammo complete with Nickel-Plated Brass cases and a Polymer Tipped projectile. 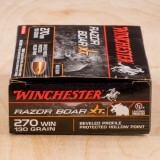 Manufactured by Winchester to the highest of standards with a Boxer primer and 140 Grain bullet, the quality components come together and add up to a round that's great for hunting big game, hunting boar, hunting whitetail deer. 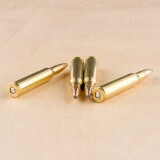 You'll get 20 rounds shipped fast when you order this today. 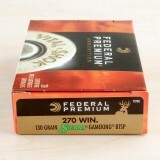 These .270 Winchester rounds from Federal's Vital-Shok line represent premium quality with high-grade components offered at an affordable price. Each round is built upon a reloadable brass casing that has been plated with nickel for corrosion resistance as well as dependable, low-friction cycling. 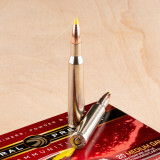 The casing is equipped with a non-caustic Boxer primer, filled with clean-burning powder, and crimped to the ribbed cannelure of a 150-grain Nosler Partition projectile; this specific crimp point preserves accuracy and prevents malfunctions by keeping the bullet from changing positions throughout recoil or rough handling. 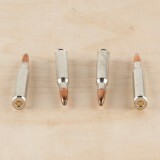 Nosler's Partition soft point bullet design calls for two lead cores which are separated by a copper divider at the center of the bullet. This copper wall is part of the jacket which surrounds both cores while leaving their tips exposed, making for a projectile that will expand while penetrating into a target, then tumble end-over-end due to its heavy bottom core. This results in greater energy transfer to the deer's vitals so that it is stopped in its tracks. 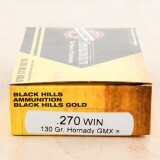 20 rounds of Black Hills Ammunition 270 Winchester ammo that'll have your gun firing for a while and your face smiling for even longer! The Boxer primer, 130 Grain GMX bullet and Brass cases on these New rounds make for the perfect companion for hunting whitetail deer, varmint hunting. 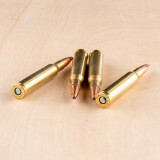 Pick up some rounds today and you'll get fast shipping along with Widener's world class service. 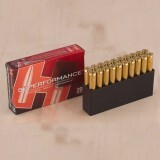 Hollow-Point (HP) ammo that's as ready as you are for hunting boar, hunting whitetail deer. 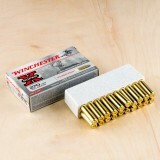 Made by Winchester, this 270 Winchester ammunition is Nickel-Plated Brass-cased, Boxer-primed with a 130 Grain bullet. 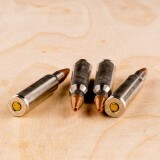 These are trusted New rounds so sleep easy knowing you're picking up 20 rounds of 270 Winchester that promises reliable feeding and extraction shot after shot. 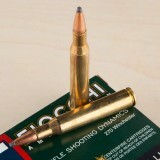 The 270 Winchester was developed in 1923 and is one of the most popular and effective hunting rifle rounds on the market. Whether you are hunting, competing in a shooting match, or practicing your skills at the range, this round has the accuracy, range, and power you need to get the results you want. Black Hills has been in business since 1981 and their products are loaded in the USA. 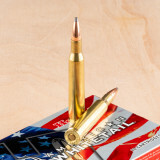 Currently, BHA provides the United States Military with match grade ammunition for their long range shooting competitions. 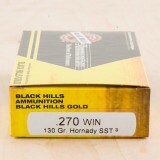 These Black Hills Gold rounds come loaded with 130 grain Hornady SST bullets that provide incredible accuracy and phenomenal terminal performance. 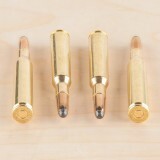 Each projectile is pressed into a factory new brass casing that is boxer primed and reloadable. 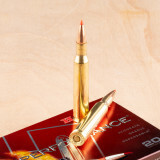 Firing at 2950 feet per second, these cartridges are the perfect option for medium game hunting.